Captain Carter's last resting place at the Parish Cemetery. 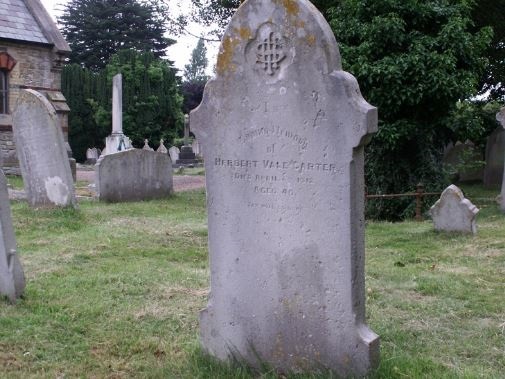 Captain Herbert Vale Carter, formerly of Ryde Fire Brigade, passed away on 6 April 1912 aged 40 years. Herbert was born in Ryde circa 1872, the son of Ryde born local coachbuilder Frank Carter and his wife Isabell who originated from Tottenham. The 1881 Census recorded the family address as 157 High Street, Ryde, and they remained there ten years later by which time 19 year old Herbert was employed in the family business as a carriage bodymaker. The inclusion of Lily Toogood, a domestic servant, residing at the family address suggests that business was good for the Carter's. In 1894 Herbert married Clara Herring in her home town, Leominster Herefordshire, but he brought his new wife back to the Island to settle. By 1901 they were resident proprietors at the Queens Hotel in Ryde's Monkton Street and had two daughters, Vera (5) and Doris (2). However by then Herbert's brief captaincy of Ryde Fire Brigade had been and gone. It began following the departure of Charles Langdon who resigned from the brigade on principle when the Town Council denied him the expenditure of new hose. The rationale behind the appointment of Herbert is unknown, neither is it known if he was previously a fireman of the brigade, but there may have been some reservation as he was initially, and unusually, awarded a six-month trial period in early August 1895. Just weeks after being appointed Herbert supervised the brigade's team that attended the IWFBF competition at the County Ground, Shanklin, on 28 August. Ryde's firemen won no trophies but the new captain must have won favour among his counterparts as Captain Ernest Willsteed of Cowes Fire Brigade included him alongside Newport's Captain Mursell for an invite to his brigade's annual dinner at the Fountain Hotel on 13 November. As this came in the wake of Cowes' success as the first brigade to win the Battenburg Challenge Cup, the coveted silverware was passed around the gathering and frequently refilled with champagne for all present to quaff heartily from the prized chalice. It suggests that there was no ill-will between the resigned Charles Langdon and his successor as both were sat at the guests table, Langdon being invited and toasted in appreciation for his efforts on account of his secretaryship of the IWFBF. Herbert wasn't called on to take command at a fire until 27 April the following year when fire took hold of the roof of 68 St John's Road. Captain Carter despatched men by escape ladder to the roof whereupon they removed tiles to access the seat of the fire and effectively doused the flames. The incident itself was fairly unremarkable other than the fact that it was the first time in the town when the newly installed telephony had been used to contact the fire brigade at the Town Hall. Superintendent Hinks of the Borough Police was made aware of the fire and made a call from the new connection between the Police Station in Brunswick Street and the Town Hall in Lind Street. Evidently Herbert's conduct was deemed satisfactory and his six-month trial period passed with him remaining at the helm. However for reasons undisclosed in the local Press he opted to resign from the role in April 1897 and in doing so made way for Sidney Charles Sapsworth and the beginning of a notable era in the brigade's history. It is known that Herbert was also a Rifle Volunteer and whilst it was not uncommon for firemen of the era to also serve as Riflemen, perhaps in Herbert's case he preferred to concentrate on a single extra-curriculur activity. Sadly Clara passed away in 1906 at just 33 years old, leaving Herbert to care for their daughters who by then were 10 and 7 years old. The 1911 Census located Herbert and the girls at The Castle Hotel, 164 High Street, Ryde, where he was the licensed victualler. More tragically for the children was that Herbert's health was also in decline and he suffered a protracted period of poor health before passing away on 6 April the following year aged just 40. Where his daughters were placed after losing both parents isn't known, but records have been found to indicate that they both married, one moving to the mainland in the process, and lived long and hopefully happy lives. Rest in peace Captain Carter.